Nanny and household staffing professionals know that there are federal and state, and sometimes city, laws that govern job application forms, interview questions, and screening processes and more. Most of these laws are intended to protect the applicant from discriminatory hiring and screening practices. In the last few years, jurisdictions have increasingly forbid or restricted the staffing agency and hiring employer from asking a nanny, caregiver, household manager, etc. about prior salary history. Why? Legislators widely believe that gender pay equity can be fostered when prior, perhaps discriminatory, pay history is out of the equation. Agencies need to tread carefully here, as these laws pop up seemingly overnight with little fan fare. They pose a challenge to the agency because their clients, the hiring families, expect them to have this information available. From Oregon to Massachusetts, Delaware to San Francisco, and beyond, agency applications and staff training should be addressed ASAP. 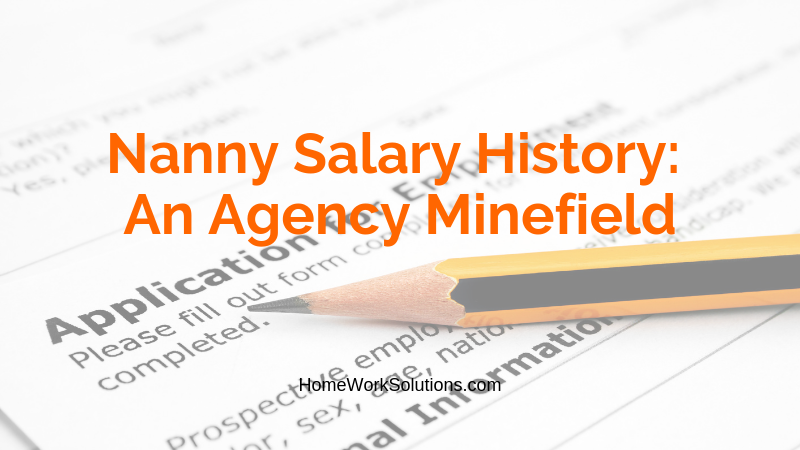 Unsure of how to approach the topic of a nanny's salary history? Clearly it is important early in the candidate review process to ensure that the family's and nanny's compensation expectations are in sync. Sending a nanny who is expecting $30 an hour to a family who is tapped out at $18 an hour clearly is a waste of everyone's time, and is frustrating all around. A useful work around is to inquire as to the candidate's salary expectations. Consider asking early in the screening process or on the job application for the candidate's salary expectations and insure it is aligned with the family's plans. Staff training and client coaching should address this and other potential tripping points in the nanny staffing journey. In addition to avoiding issues of salary history, you perhaps have ban the box legislation prohibiting questions regarding prior criminal histories, have employer classification issues, sick time and paid family leave regulations, payroll tax and insurance, all of which require careful training of staff and education of clients. Be aware that the agency owners can be held liable for violations by their staff! With the myriad changes that have occurred in the last several years surrounding recruitment and employment, now might be a good time to have your agency's application and screening practices reviewed by a competent employment law attorney. Preemptively removing or rewording problematic application and screening questions is a solid strategy to minimize risk. "Get out ahead of the issue by changing your paperwork, processes and procedures NOW because these salary history bans could be coming to a jurisdiction near you. In California, for example, all agencies and families are covered." advises Bob King, Esq., founder of Legally Nanny ®, a law firm that specializes in representing nanny and homecare agencies and household employers. And review and modify all paperwork, online applications, and screening questions and scripts.